You’ve probably read somewhere how people on remote Mediterranean islands live until they're 200, subsisting entirely on olive oil, wine, and laughter. That's all fine and dandy -- but most people can't just up and become Zorba the Greek. So where can you live long and prosper in the good ole USA? Turns out, Pitkin, CO, is the place for living the longest and healthiest life. Or so says the University of Wisconsin's Population Health Institute, which determined the percentage of residents who live past the age of 75 in 3,000 US counties. Pitkin has the lowest mortality rate in the nation at 118.5, and only approx. 2,835 premature deaths (before the age of 75) per 100,000 residents. TL;DR: pretty much everyone lives a long time. 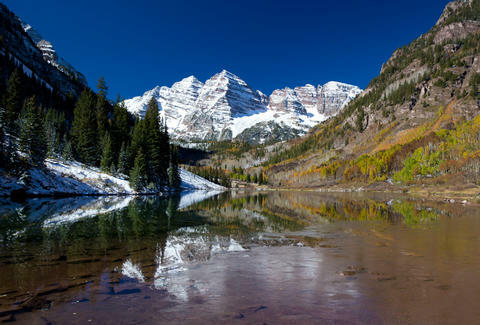 Summit, CO, is the second-healthiest county, with a mortality rate of 121, while four more Colorado counties -- Eagle (no. 5), San Miguel (no. 6), Custer (no. 7), and Douglas (no. 10) -- make up over HALF of the top 10, proving that clean mountain air is really good for you. And in third place: Presidio, TX, with a mortality rate of 126.3. No explanation how a Texas border town gets there. As for the places with the worst lifespan outlook, Oglala Lakota County, SD, lands at the bottom of the list, with a shocking mortality rate of 983.4 -- that’s 25,394 premature deaths per year, thanks to smoking- and obesity-related health problems. Woof. Todd, SD, claims second place with a mortality rate of 878.2 -- nearly TRIPLE the national average of 376. While more counties in South Dakota -- Dewey, SD (no. 5), and Corson, SD (no. 6) -- follow shortly behind, McDowell, WV, claims third place with a mortality rate of 861.2. Check out the full top and bottom 10, along with mortality rates, below. Head here for more of the results, and an interactive map to see where your county lands.